Every designer knows that careful attention to detail on their designs is important to ensure the manufacturing team can build the best product possible. However, in Hollywood, a lot can be done with special effects and CGI alone so what if there is no a physical manufacturing? What if they are just designing for the digital world? Should designers still be focused on details too? Well the answer is ‘Yes, definitely they should be!’ Check out the images below and tell me and if they are not designed to the minutest details! SOLIDWORKS is best known for its ease of use. Here at SOLIDWORKS our goal is to allow users to focus on design instead of the software. As Einstein said, “imagination is more important than knowledge. For knowledge is limited to all we know and understand, while imagination embraces the entire world, and all there ever will be know and understand.” When I saw this quote for the first time, I thought it is exactly what we do at SOLIDWORKS. We let people focus on their imagination. This year we heard a lot of great stories during SOLIDWORKS World, but the one that really stood out for me was this one. 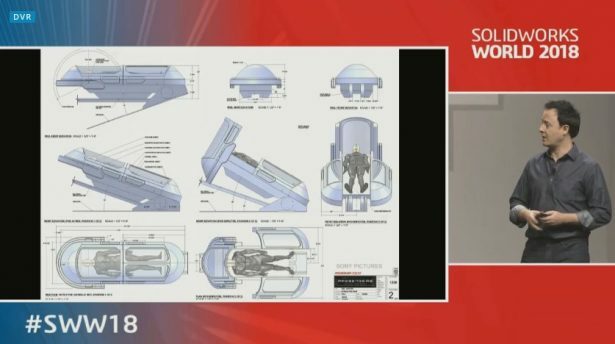 Seeing the images on the big screen I initially thought they are just straight from Hollywood movies, but they were actually the SOLIDWORKS images! The designers came on stage and showed other images of their designs that were featured in Hollywood movies. I was blown away and realized that designers focus on their dreams and imagination while working on such complex models. Otherwise they would not be so unique. Did you know Batman’s car was designed using SOLIDWORKS? Did you know the spaceship in the movie Passengers, starring Chris Pratt and Jennifer Lawrence was also designed using SOLIDWORKS? The one that surprised me the most was Transformers! At SOLIDWORKS World 2018, Joe Hiura and Robert Andrew Johnson, art directors and set designers from the film industry, spoke about how they used SOLIDWORKS to design movie sets for films such as Oblivion, Passengers, Tron Legacy, and Batman V Superman. Robert said that movies are very collaborative in nature, with many parts that must come together to make the final product, which requires them to be fast and agile to meet the short deadlines. SOLIDWORKS is what enables them to meet this challenge. They shared how they utilize SOLIDWORKS to create magic on the silver screen. One of the biggest advantages Robert and Joe spoke about was the ability to manufacture and machine these massive Hollywood sets directly from their SOLIDWORKS CAD file. This competitive advantage allows them to prototype their designs much faster than using other CAD modelling tools, while paying attention to all those little design details. Isn’t it awesome how being able to focus on design instead of software enabled them to imagine these models? You too can bring your imagination to life using SOLIDWORKS products. Click here to start your SOLIDWORKS CAD trial. Recently, Joe started using SOLIDWORKS Visualize to create photo-quality images and animations of his Hollywood creations, before committing tens of thousands of dollars to physical prototyping. This helps Joe speed up approvals of his designs from the art directors and producers of these well-known movies. 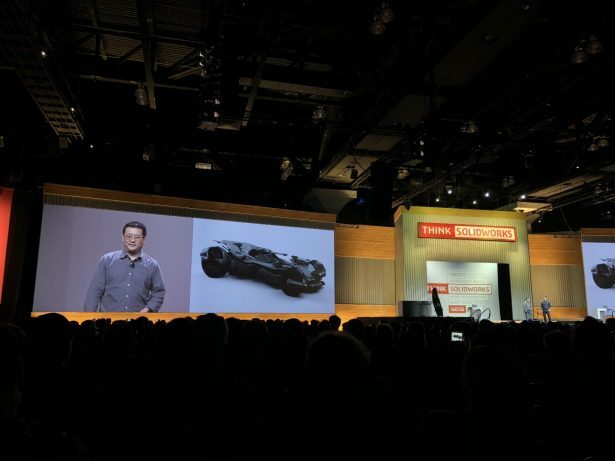 In fact, this image of the Batmobile below was one of his first images he created in SOLIDWORKS Visualize. Joe said he’s blown away by how fast he’s able to create this content and can’t wait to use Visualize to bring his designs to life for the next blockbuster movie.